Joanna Redford, Karl's sister, has written with the sad news of the sudden death of Karl White in September 2006 aged 43. Karl attended SJN from 1976 to 1980. He moved to Reading and worked for the Post Office and remained in Reading until he died. If anyone wishes to contact Joanna, please contact the Hon. Sec. for her e-mail address. The foundation stone was laid in 1936 and the new building opened officially on 2nd November 1937 by Miss G E Hadow M.A (Principal of the Society Of Oxford Home Students) The building replaced the existing school which was housed in a number of wooden huts placed in a small site adjoining the Vicarage. Miss Lardelli, the Headmistress who was a driving force behind the plans for the new building, sadly died in 1935 before it was opened. She is buried in Brigg. A Reunion is planned for Saturday, 30th June 2007. The school will be open from 1pm to 4pm with pre-booked light refreshments served from 2pm to 3pm. To help with catering we ask you to send a cheque for £5.00 made payable to The Briggensians Association for refreshments and a memento. If you have any photos or memorabilia you could give or lend for the occasion please let us know and be sure to give an address for their safe return. Contact me via e-mail or at the School address. By the way, I have been contacted by two of the girls who were pupils in 1937! 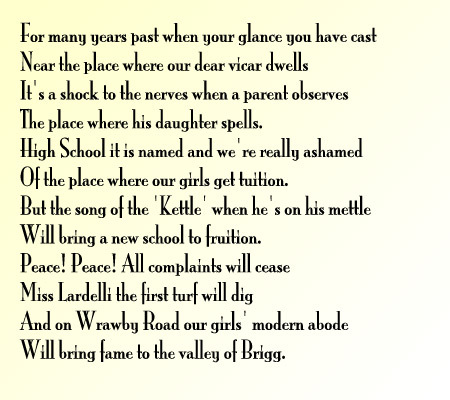 I came across this poem whilst visiting Peter Bell whose wife Ivy had been involved in Brigg Ladies Hockey for many years. The verse was sent in as part of a History of Brigg Operatic Society by former member Mrs Reilly (Miss P Bell), who is now 80 years old and living in Stamford. She recalls that it was based on "The Rajah of Bhong" which they used to sing at the Girls' High School after the "Country Girl" production, at which she was selling programmes. The Vicar at the time was Mr Burgess, Mr Kettle was a local councillor and undertaker and Miss Lardelli was the Headmistress. Many thanks to Brigid for sending this in. Download the poem as an Adobe Reader text file from the Library.